Coleco Keypad is emulated on the number keys from 1 to 0. "*" and "#" are emulated on "-" and "=". Following exactly the original game, pressing those keys at the options screen will change foreground and background colors. ROM files are available, as usual, at the website of MSX História. The website will be updated to host four special reviews of all conversions by Muffie: Tutankham, Pepper II, Montezuma's Revenge and Jungle Hunt. As usual, Muffie will appreciate any comments, bugs and suggestions you have. Simply write them in the reactions, and you'd make him a happy MSX fan today - which happens to be his birthday! 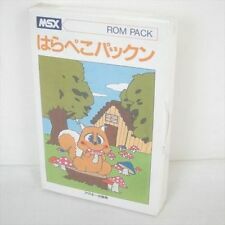 Thanks for bringing this nice game to MSX users. And happy birthday. This game has many many nice technical tricks and details than can be spotted only using meisei. Very good solutions and high level use of the tms9918. Thanks for this port !!! And happy birthday! mm, certainly not an MSX1 palette.. Regarding the picture, must say he´s kinda strong imperialist! As he´s swinging in the air, while holding big and heavy iron cauldron, full of water and woman inside it, with just one hand. Artrag´s last picture is quite nice! Picture is maybe bit too bright, but looks very good otherwise! Maybe you can draw crocodile and some other stuff bit more visible? anyone willing to improve it ? Best would be to completely redraw it, keep the original in the back, make some new layers in photoshop and draw whatever there is to see again over the old one, but then made with the MSX 1 palette and the colorspill lack of detail in mind. I agree. Those scanned hand-drawings pictures look awful with all those filters and algorithms that are used to lower resolution and decrease color depth. Personally I would hate seeing a screen like that in a 80's game... The redraw option, directly on a computer, using MSX1 colors, at least for me, seems like the best option. By far. muffie, VALKYR has some questions about Jungle Hunt that he would like to get answered. He has posted them here. Ivan, I posted this answer there. It's in English. Sorry guys, my Spanish is beyond terrible. * 100% correct emulation of Coleco's keypad - You can see that at the title screen where you can use some keys to change the colors, exactly as in the original version. * All sounds are emulated. You hear all sounds that were created by the programmers of the original version. Some of them sound different. That's because Coleco and MSX sound chips have noise differences that makes translation physically impossible. At least on my version, everything is there. * All MSX are supported. The other version incorrectly assumes that all RAM is located in the same slot, what, for example it is not true on some Sony models. 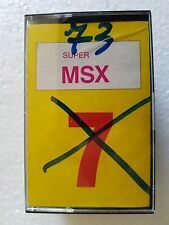 That assumption does not comply with msx standards. * The other version is not freely available, you have to pay for the cartrdige as you cannot get the ROM file. Mine, is 100% free. Mainly because it is all based on copyrighted material. * The other version has a "opening static screen". Mine, up to now, is 100% faithful to the original. Later, before creating the cartdrige, I'll add something else, like I did with my version of montezuma, which have the Sega Master System music at the title screen. *PS* Personally I'm not a huge fan of "static" opening screens, I prefer to add some minor changes to the original selection screens or add music. Anything, just shoot me an e-mail. If you prefer to send it in Spanish, that's fine. Probably I'll understand the meaning, but I'll respond in English or Portuguese. You choose! How do you know all that? You actually bought SLotman's cartridge version? I tried, 1.5 years ago. But he refused. Mainly because he does not like my site: Baudejogos.net. A friend of mine bought the game. I am not against those BMP2SCREEN2 style tools, they are very nice tools to play with, but they usually give too modern look, if results are used to 1980s game..... resulting picture somehow look TOO GOOD to fit in 1980s game. But if someone can make good picture with such tools, you are welcome to do so. But still I prefer "hand-drawn" computer graphics, which are made using original computer (or emulator) and some paint program or character editor, without modern day PC-tools and scanners. "Hand-drawn" graphics have their own charm which cannot be imitated with BMP2SCR2 style stuff. muffie, how many spare bytes you have in the roms? On Jungle Hunt a little less than 8k of unpacked data, assuming that the cart will continue to be a 32k rom. Anyway, would make ANY real difference in the cartridge costs to produce a 32k rom instead of a 48k??? Some professional developers in the 80's used cross development tools as well, back then it was most likely Unix systems, but still. The BMP2SCR2 style tools are indeed more modern but it would not have been hard to run those tools on the old Unix machines in the 80's. Scanners weren't commodities that everyone had back then, but certainly bigger studios. But even though it would have been possible to use these algorithms in the 80's, I also prefer hand drawn images. The fancy algorithms doesn't imo work that well on a bigger screen. The effects are cool for a short demonstration but doesn't really work in an actual game. The effects are cool for a short demonstration but doesn't really work in an actual game. But it also depends whether one is making 1980s port/conversion or "modern day style graphics" game, I guess in latter case scanned and bmp2scr2ed picture may suit well to that game. But it´s sure, that it depends a lot that how the original picture looks like and how well bmp2scr2 part is done. And it depends whether scanned picture is used to MSX-1 or MSX-2 game, scanned pictures suit more well in MSX-2 games, me thinks. As MSX-2 can produce higher quality pictures, like PCs. And so it´s much easier to get better results for MSX-2. I know that some/many companies used cross development in the eighties, but I am just bit too conservative when it comes using these modern day PCs.... even I know that same PCs make it possible to play old Colecovision gems on MSX.... But of course you are welcome to use modern PCs to develop/port MSX games, I don´t mind that much, as long as I like your games! Zemina has composed psg tunes very well. I guess I don´t need another Knightmare, but must say it looks good. I think that in that way, we (the community) could even produce cartridges that will look the same as the originals from Korea. I tested it on my A1GT and it does not read the keyboard. Nice. Muffie was completing 32 years old exactly 4 years ago and releasing Jungle Hunt!